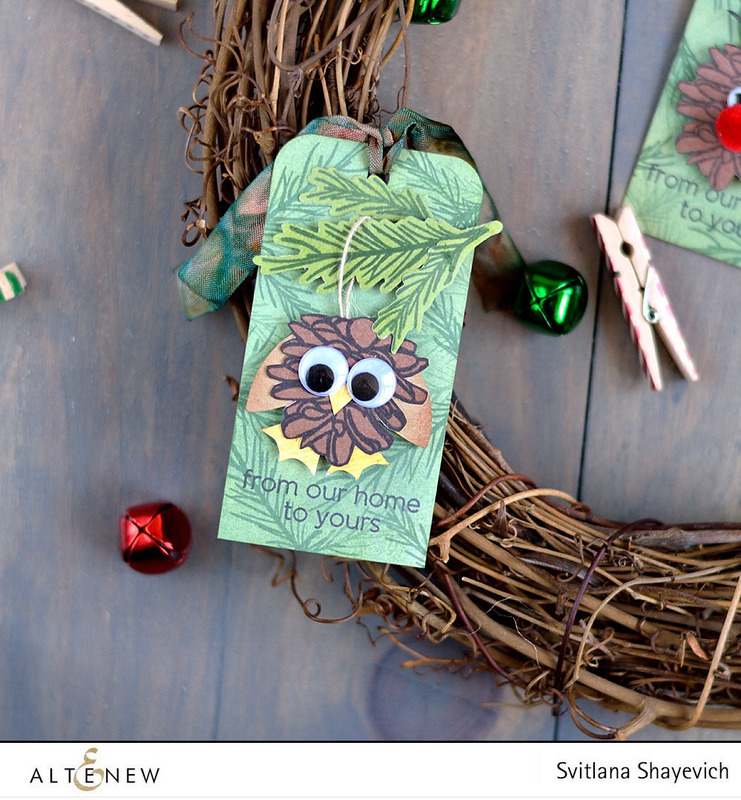 Svitlana is here sharing two fun tags and a card. 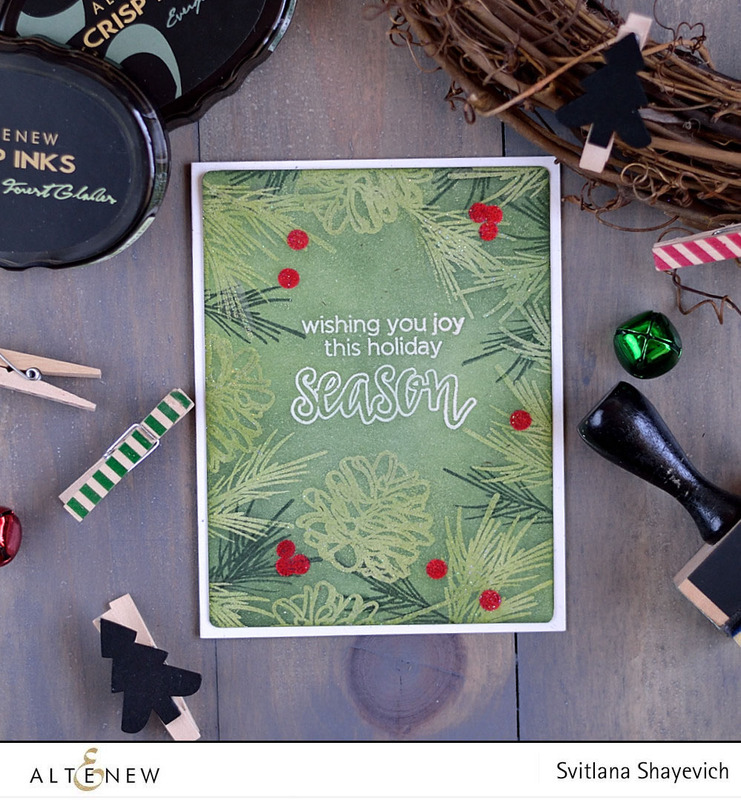 To create tags I first cut a tag shape from Classic Crest Solar White cardstock and created background by first inking them with Forest Glades and Evergreen inks and then stamping pine branches from Poinsettia & Pine stamps set using Evergreen ink. I made first and second generation stamping, to achieve more realistic look. With Jet Black ink stamped the sentiment from Halftone Holidays set. 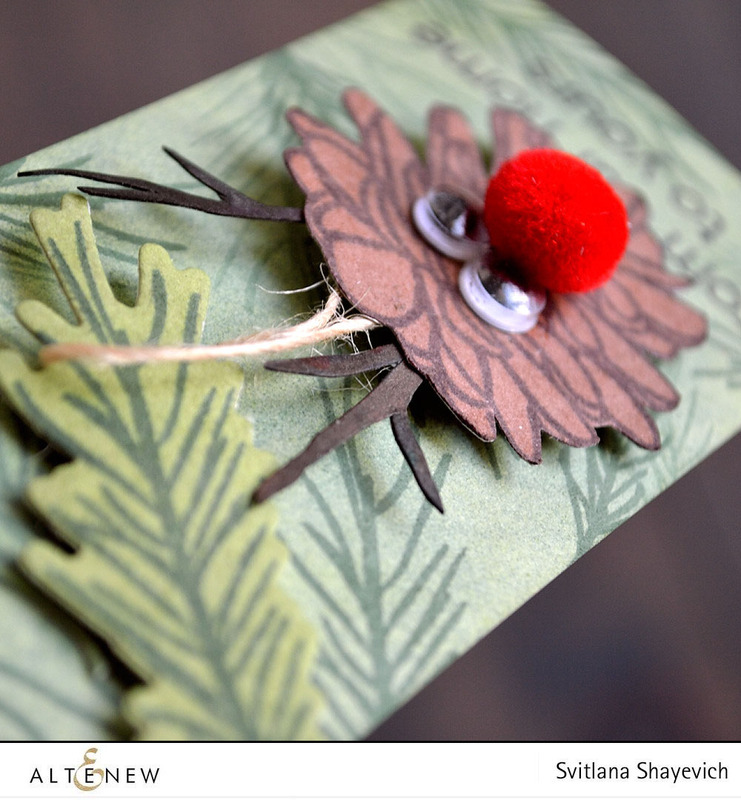 Then the funniest part – creating animals, using a pine cone from the same Poinsettia & Pine stamps set as a base. I inked a piece of Classic Crest Solar White cardstock using Dark Chocolate ink, stamped the pine cones in Dark Chocolate and Jet Black and fussy cut them. 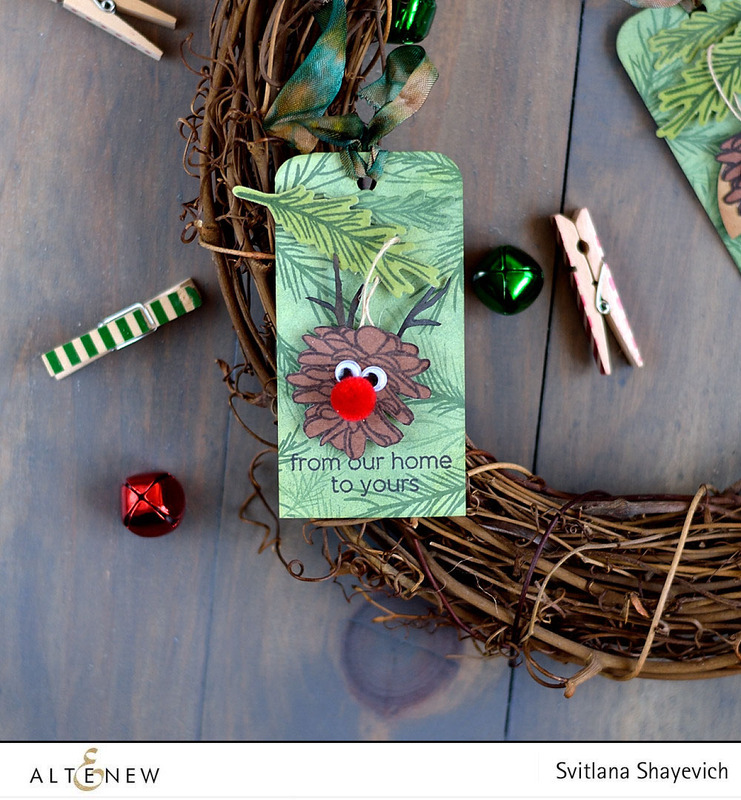 Used one pine cone to create a reindeer, by adding small googly eyes, a red pom-pom and antlers (made using the branch stamp from Winter Cardinal stamps set). For the owl I took bigger googly eyes (when it comes to owls – the bigger eyes the better). Legs, wigs and beak I hand cut from paper scraps. Next I made several pine branches using Poinsettia & Pine stamps set. Inked scraps of Classic Crest Solar White cardstock using Forest Glades, stamped the branches with Evergreen ink and die-cut them with corresponding Poinsettia & Pine dies. Hanged the pine cone buddies with a piece of twine from branches, adhering both pines and cones with dimensional adhesive. 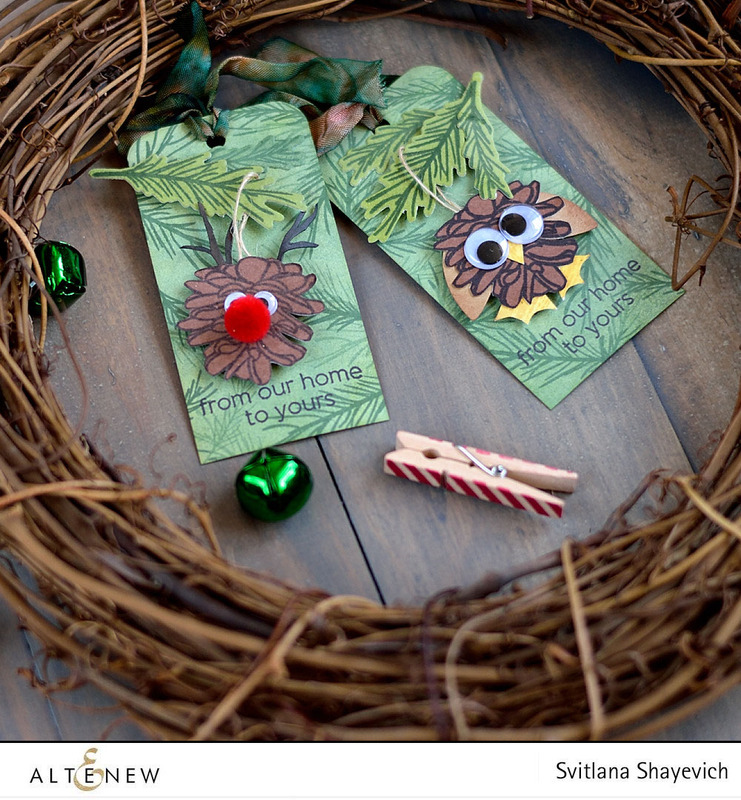 And finally tied some ribbon to the tags, which was colored using Evergreen and Dark Chocolate inks. And as I already had holiday stamps set and inks out – decided to create a quick card the idea of which was in my head for a while. Starting with a cream cardstock panel I stamped berries from Winter Cardinal stamps set in Ruby Red ink and clear embossed them. I sprinkled clear embossing powder over the stamped berries right away so ink was still wet enough to “accept” the powder and there was no need to use clear embossing ink on the top. Next I clear embossed the sentiment from Halftone Holidays set in the middle of the panel. Inked the whole panel using Forest Glades crisp ink and put it aside for some time to let it dry completely as the next step was some more clear embossing. 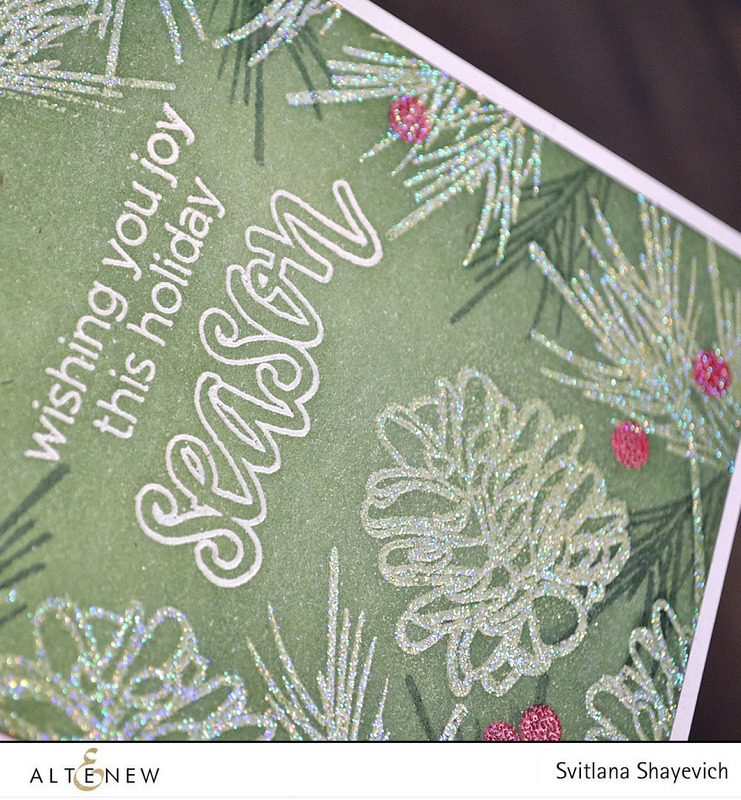 Next I embossed pine branches and cones using iridescent embossing powder. And did some more inking of the panel, this time using Evergreen ink. Finally I stamped some more branches Evergreen ink, carefully removed ink from embossed images with damp q-tip, rounded the corners of the panel and adhered it to a cream card base. I like the multi-dimensional look of this card which is at the same time is almost a one-layer one. Hope you like my projects. Have a great weekend! Svitlana, these are all fabulous! 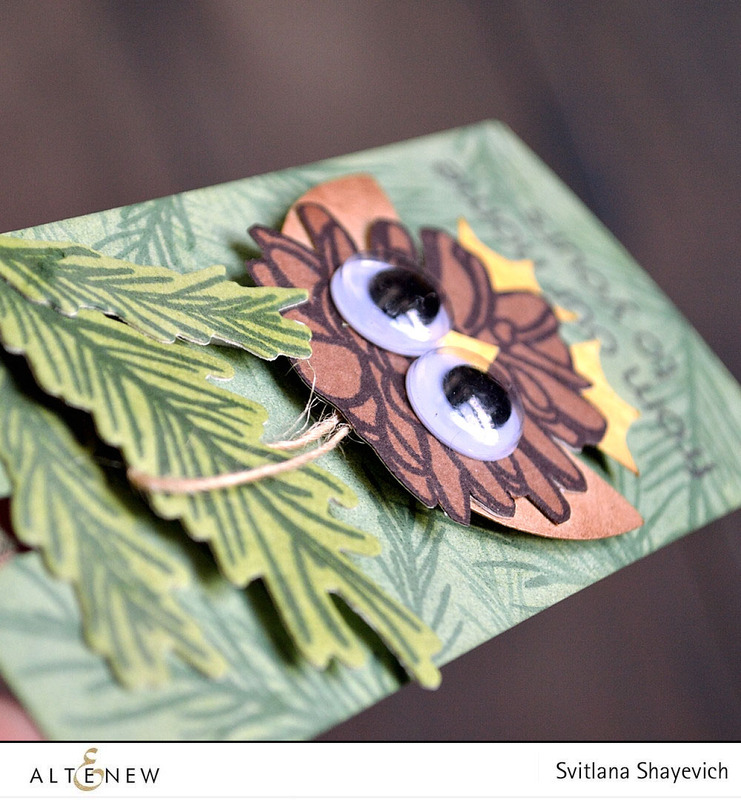 Love that gorgeous shimmy card and those tags are beyond adorable! Such a cute idea with the pinecones! The card is so pretty too! Wow!!! Fantastic card and tags!! Sooo creative!! Great creations! Love how creative you got with the pinecones!